Need your new watch bracelet sized to fit, or a new battery in a trusty timepiece? We can help! Or do you have a much more involved job, like a complete restoration of your great-grandpa's pocket watch or a service on a valuable Swiss timepiece? We can do that too. Just looking to spruce up your watch? 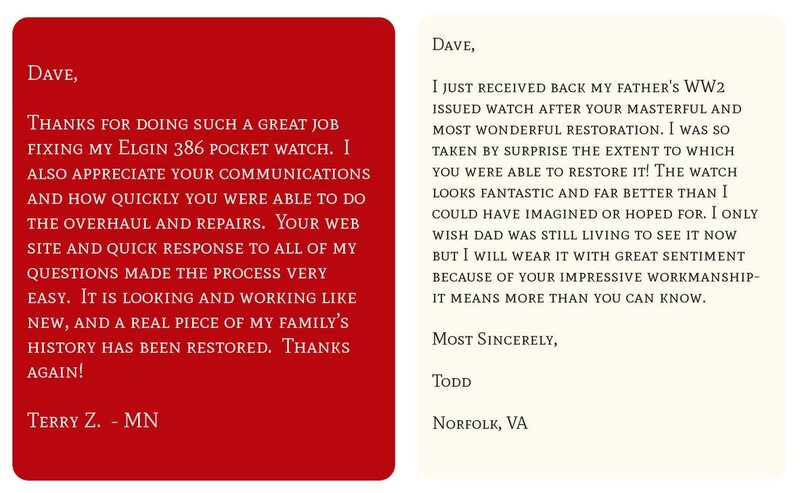 We can do anything from a quick hand-polish to a total case and bracelet refinishing, or set you up with a quality new bracelet or strap to revitalize your watch. From high-end brands like Patek Philippe, Rolex, or TAG Heuer to your everyday Seiko or Fossil, The Last Wind-Up can work on practically any wrist or pocket watch, and solve practically any problem! 30 years watchmaking experience and an extensively equipped workshop (see our About section for details) means our owner Dave or one of our technicians can do most of this work in-house. However, we do sometimes send timepieces out (with your approval) to manufacturers or specialists that we've built relationships with over the years if necessary to ensure the absolute highest quality of service. Estimates are always free of charge and we don't do any work on your piece until you approve it. We warranty our work for up to a year, depending on the service performed.